Every football fan knows how difficult it can be to get to and from a football game. Especially one held by a team in the top divisions. Their stadiums can hold thousands of people and all the people going to and from the game grounds creates a traffic and parking nightmare. Thanks to ST Minibus Manchester one of those nightmares can be avoided. When you decide to go to an Everton FC game and book travel through us you won’t have to worry about parking. We will pick you up from your home and take you and your friends to Goodison Park in time for the match. When the game is over we’ll be ready to pick you up and take you home too, making the travel as easy as it’s going to be. Goodison Park has a whole litany of history attached to it. It stands as one of the oldest football stadiums and has hosted a wide number of historic footballing events including several games in the 1966 World Cup and important games from other famous footballing tournaments. It also held the attendance record for women’s football for a long time before the record was finally broken again in 2012. Goodison also has the distinction of being the first football ground to be visited by a reigning monarch. In 1913 King George V and Queen Mary visited the ground and were given a royal welcome. While the main purpose of going to Goodison Park would be to see an Everton FC match there are some events that go on during the year at the park that aren’t entirely related to football. 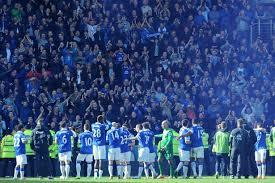 Goodison has hospitality events during the season and you can book travel to those too. The park is filled with history and it’s a trip worth taking even outside of game day. ST Minibus Manchester offers trips to Goodison Stadium for Everton fans to go and enjoy the game, and also for non-fans who want to see the stadium or see what all the fuss about Everton is about. They’ve been a staple of the premier league for over a hundred years and have only been relegated twice in their history. They’re a team with a very rich history and you can enjoy them cheaper and easier through us. All you have to do is buy the tickets and book a minibus and away you go to one of the best football experiences of your life.